One of the things I love most about Chris is that he is a man’s man. Even though he is a self-proclaimed techie dork and he’s better than me at folding clothes, he loves James Bond movies and watching football in bars (even though he doesn’t drink) and riding his motorcycle. And he has tastebuds to match. I’ve discussed before how Chris and I have extremely similar tastebuds but there are just different preferences that we each have. Even though we like pretty much all the same things, we sometimes prefer different things, when given a choice. When I might prefer a bowl of roasted root vegetables and nothing else, he would probably want a vegan meatball sub. When I would probably choose a kale salad, he is more apt to choose pizza. If we were watching a football game, though I would lean towards a nice spread of veggies and various dips, he would go crazy for a big pile of nachos or vegan buffalo wings. So yes, I made what Chris deems as the one of the best things to ever come out of our kitchen. There were the muttered expletives with each bite and there was the promise that I would make this on a regular basis, that he made me make. These occurrences, however, don’t even begin to describe how amazing this meal was. Because I’m in to quick dinners lately, I used a store-bought, cornmeal-based crust from Viccolo that Cadry turned me on to (they come in regular and wheat-free, but if you need to, you can use a gluten-free pizza crust, though I have no recommends). 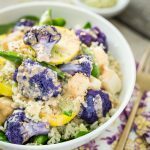 I adapted this simple and delicious recipe from The Vegan Pact to make spicy buffalo cauliflower wings and then because nothing goes better with buffalo wings than blue cheese, I made a vegan tofu-based blue cheese-style spread. And this whole meal came together in less than 45 minutes. 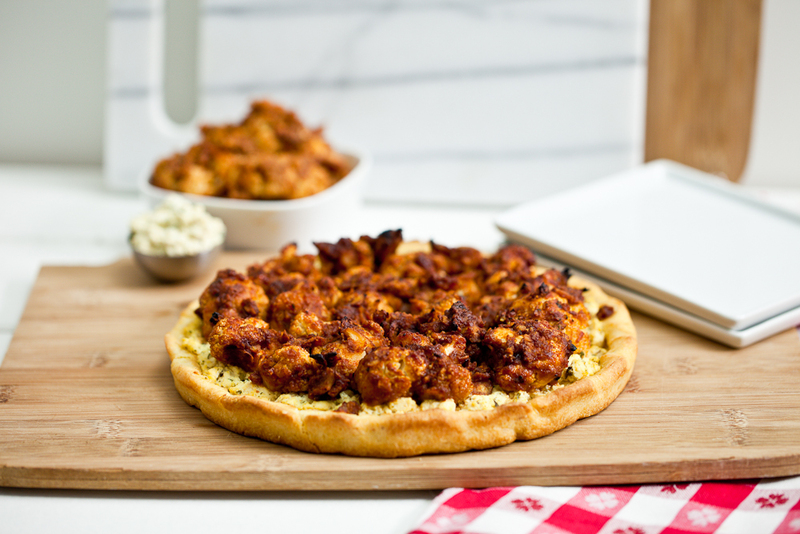 I love roasted cauliflower by itself, but when it’s coated in a chickpea flour crust, then smothered with barbecue sauce and Sriracha, it becomes a whole new beast entirely. The smoky, rich barbecue flavor of the roasted buffalo cauliflower wings paired beautifully with the creamy, tanginess of the blue cheese spread and there couldn’t have been a better vessel to deliver these goods to my mouth than that incredible, crunchy cornmeal crust. Even though I created this pizza to appeal to Chris’s tastes, I think I loved it just as much as he did. I was just as bummed as he was when the pizza was gone. 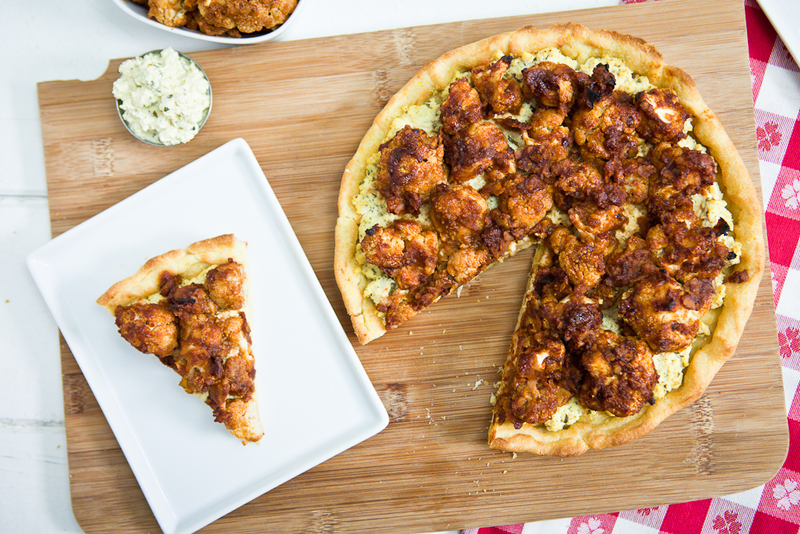 For several days after, we would say to each other “Remember that crazy-amazing buffalo cauliflower wing pizza?” Then we would sigh and spend a moment reminiscing over the pizza. We both agreed that it would be perfect for watching the Super Bowl and all of the play-offs leading up to it, and a James Bond movie marathon just doesn’t feel like it will be complete without it. Maybe it’s the deliciousness of this pizza that I like. Maybe it’s how much Chris loves it that makes me love it even more. Either way, I foresee much football and James Bond and much more of this pizza in both of our futures. Place the tofu crumbles into a medium bowl. Add the rest of the ingredients and stir to combine. Chill until ready to use. Enjoy! *You may need to adjust the seasonings to fit your preferences. This was slightly on the mild side for me. Preheat oven to 450 degrees. Lightly grease or spray a glass 9 x 13 casserole dish with olive oil spray. Whisk almond milk, chickpea flour, garlic powder, and paprika together. Dredge cauliflower pieces into flour mixture and place in the casserole dish. Bake at 450 degrees for 20 minutes. Meanwhile, mix together the BBQ sauce, Sriracha sauce, arrowroot, salt and pepper. 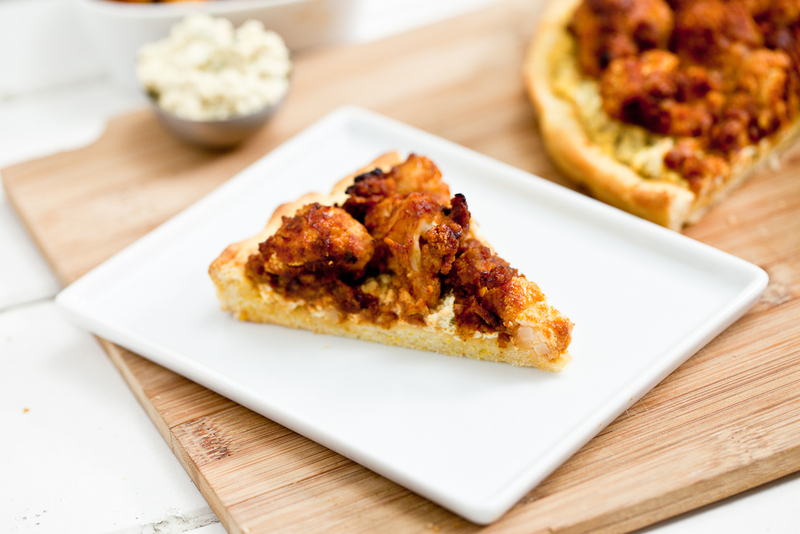 Once cooked, toss cauliflower with BBQ mix and bake for an additional 5 to 8 minutes. Remove from heat and serve hot (or use on pizza). Enjoy! Preheat oven to 475. Lightly grease a baking sheet or line with parchment paper. Spread a layer of tofu blue cheese spread on the prepared crust, using as much or as little as you like. You will most likely have leftovers. Spread the buffalo cauilflower wings out on top of the blue cheese spread. You will likely have a few of these leftover as well- they’re great appetizers for while you wait for the pizza. Bake at 475 for 12-15 minutes, until heated thoroughly. Remove from oven and serve hot. Enjoy! 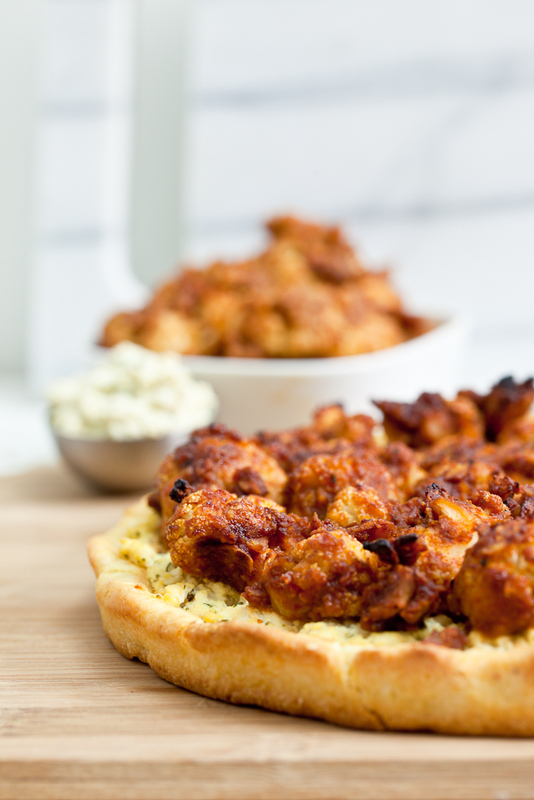 120 Responses to "Buffalo Cauliflower Wing Pizza with Tofu Blue Cheese Spread"
I might need to try this for my man. He’s far from vegan but will eat whatever I place in front of him, provided it isn’t too much like rabbit food. Lentil Shepherd’s Pie and pasta dishes have worked so far, but I think he might like this too. Thanks for this brilliant recipe! I don’t blame Chris for being floored at this one! This is just ridiculous Kristy, but in the best way possible! 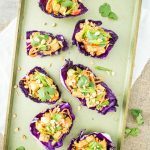 I definitely need to make that cauliflower- you really can’t go wrong with something coated in sriracha! this is my dad’s idea of the perfect pizza! growing up, he LOVED blue cheese dressing and chicken wings. so did i 😉 nowadays, he eats less caloric and fat dense foods, which is best for his health. i’d love to make this for him! I made a copycat recipe from LA’s Mohawk Bends and it was awesome. Manly, yes, but I like it, too ;-)! Looks fabulous, Kristy! Oh man, this looks incredible! I will definitely be making that Bleu Cheese spread recipe in the near future as it was one of my biggest loves in my pre-vegan days. Also, you and Chris are so adorable, I love it! Awww, shucks! Thanks, Jackie! If you love super-strong blue cheese (like I did, back in the old days), you may want to up the lemon juice and play with the seasonings. I made this one pretty mild in order to offset the spiciness of the cauliflower. That’s such a fantastic idea! 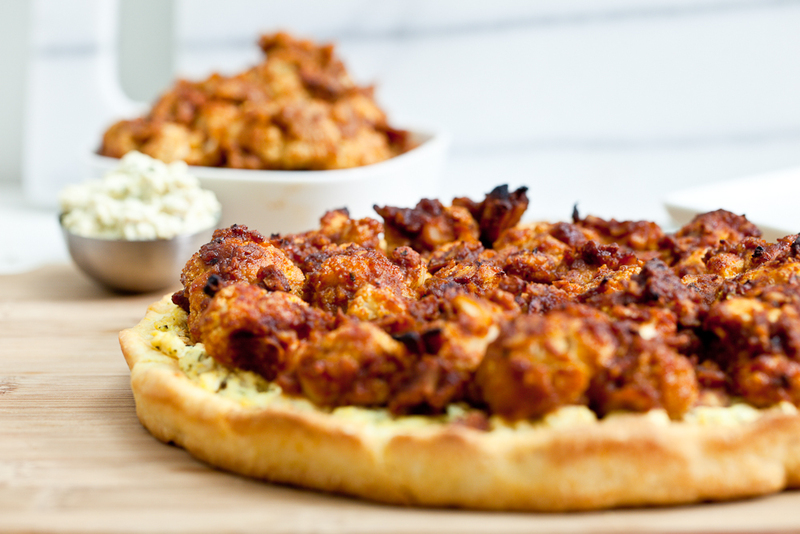 Cauliflower meets buffalo wings surely gets you a place in a vegan hall of food genius somewhere! Oh man, this looks and sounds super yummy! I’m definitely putting this on my list of things to make! The cauliflower is eye-popping gorgeous. The whole dish sounds wonderful. Last time I looked at Viccolo crusts, though, they didn’t have a gluten-free one. They do make a wheat-alternative crust with spelt, but spelt contains gluten. If they have a gluten-free version, I’d sure like to know about it! i love love that conversation.. there should have been a video with close up of the expressions! 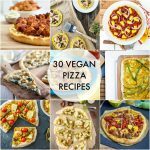 this is such a must must make pizza! 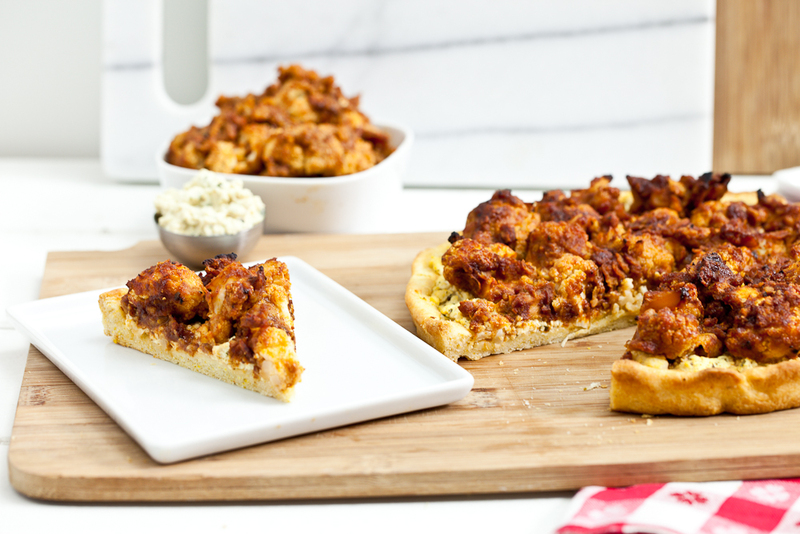 those bbq cauli wings are calling my name! This looks so delicious! 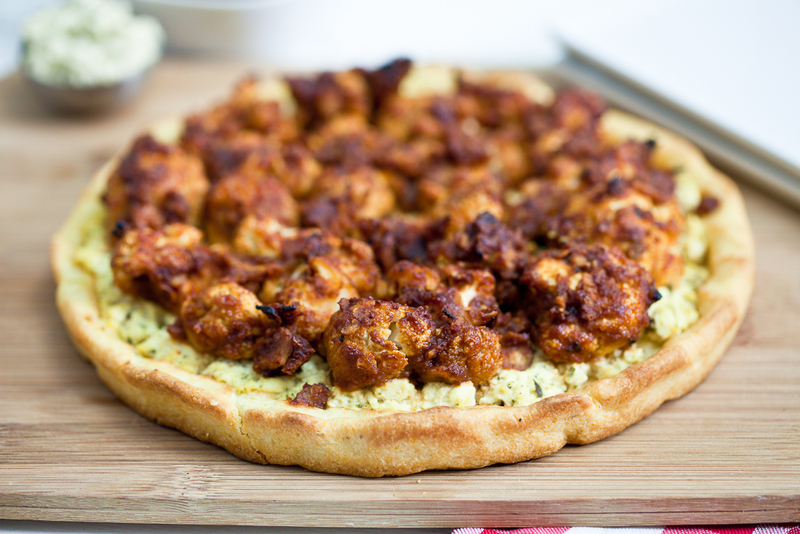 I’ve done a buffalo-sweet potato pizza in the past, but love the idea of buffalo cauliflower…sounds really tasty. I’ve never liked blue cheese (voluntarily eating mold? No, thanks) but I for sure want to try yours! 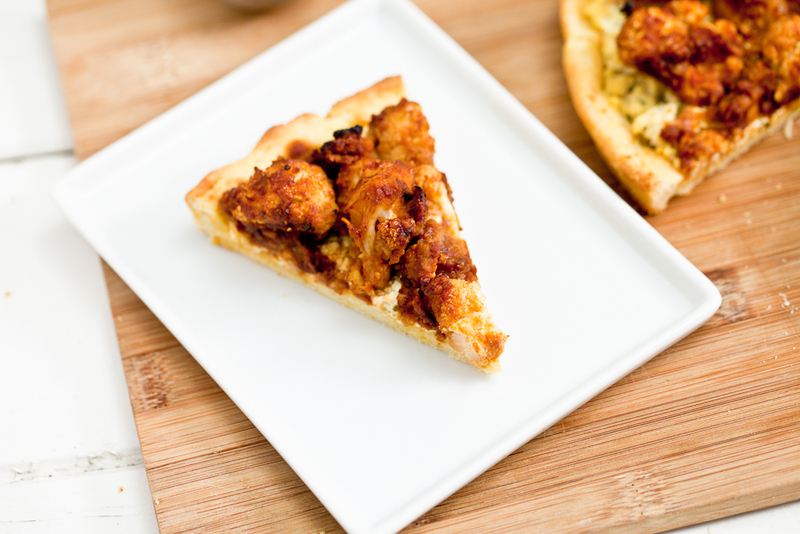 I know my bf would love this pizza–he used to love hot wings but doesn’t eat chicken anymore. This is a great way to give him that buffalo flavor! You’re in luck, because my “blue cheese” is super mild and doesn’t taste moldy at all. 🙂 I hope you and the boyfriend like it! This looks so amazing!! I love it that you used the cornmeal crust. When I saw you were having pizza I immediately assumed you were still coming home after hours of traffic and making crust from scratch! Aren’t they so handy to have on hand? They’re a great quick-meal option. And those toppings are completely up my alley. I didn’t used to like blue cheese, but all of the ingredients in this one definitely sound like flavors I’d enjoy. Wow, this sounds amazing, and your pictures make it look massive but clearly just right for two people because its so good. My man won’t eat blue cheese because the idea of the mold bothers him too much, but this version seems to have the taste without that mold so he has no excuse not to try this. Can’t wait to try it! I made this for Christmas Eve and it was a hit. I loved it and am enjoying the leftovers immensely. Thank you for another great recipe! I love hearing that! Yay! Thank you so much! I made the cauliflower wings & they were delicious!! Thanks for the recipe- definitely a keeper. Sounds delicious – should fool them completely! Thank you. Ah-mazing, simply delectable!! My fiance and I enjoyed every bit. We had it over brown rice bc I was lazy. The options are endless, the batter would be so divine with okra, like fried okra. Thanks so much! Thank you, Carrie! I’ve made the cauliflower by itself many a time and served alongside a salad or something like that. I think the rice sounds like a fine pairing! This was our dinner tonight, and it didn’t disappoint! I’m already looking forward to making it again. Thanks! What size package of tofu are you using? I don’t think the tofu I can find here is standard North American size. Thanks for the recipe! The last vegan blue-cheese thing I looked at called for a prepack vegan bleu cheese to add, and I think it would be very hard to find, whereas miso is a staple. Sorry , but I just want to be clear – does that mean you use 7oz of tofu for this recipe? It should be one 12-ounce package of extra-firm tofu, drained. Made this tonight and it was great. Thanks for the recipe! I ended up using hot sauce instead of Sriracha because I couldn’t find a veggie Sriracha (they all had fish extract) were you able to find a brand that’s vegetarian? Holy. Mackeral. This needs to be made by me, and I most seriously mean Pronto. Unfortunately, I am not a good, intuitive cook, but I am a brilliant recipe follower (tehe). One thing I am puzzled about (I seem to be the only one who has to ask this, which makes me feel rather dull indeed) is after following you recipe for the wings (it finishes with baking them for another 5-8 minutes, do you top them on the pizza and bake the entire thing yet again for 12-15 minutes (at 475 degrees)? So… In total the wings get baked: 1)after being dredged with the almond milk and chickpea flour mixture. 2)after being coated with the BBQ mix. 3) one last time on top of the pizza??? Sorry! Your instructions are clearly clear. But I am a bit challenged, although that will not stop me from endeavoring in this delish glory! I am so excited to make this for blizzard dinner tonight! But I just realized I don’t have chickpea flour. Can I sub regular flour? Thanks!! Yay! Not for the blizzard, but for pizza! 😉 Any flour will work- I just used chickpea for the added protein/nutty flavor. Enjoy! Thanks! It worked just fine with regular flour – my husband and daughter loved it! We’ll definitely be making it again with chickpea flour. Amazing! Hi Kristy, Must tell you that I made this for dinner last night and it rocked! 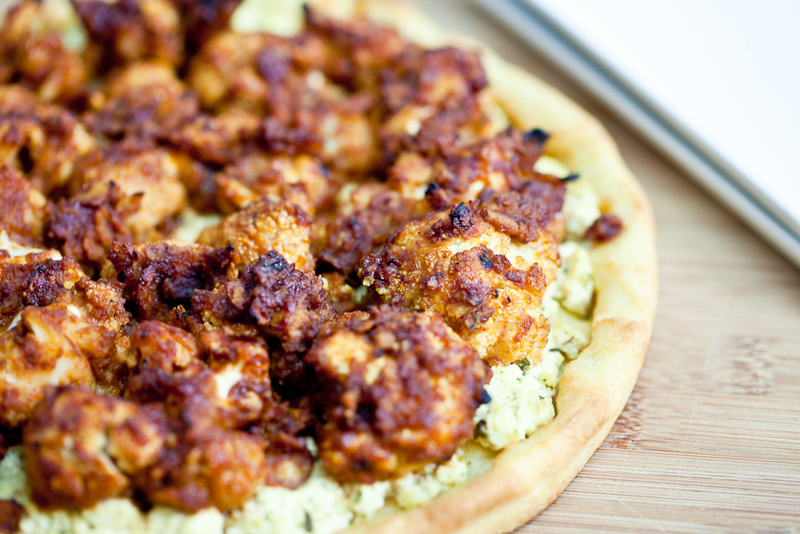 I made a cornmeal crust pizza from scratch and topped it with the blue cheese (minus the miso as I had none) and the cauliflower wings and it was superb! Thank you very much for sharing as I never would have thought of turning into cauliflower into buffalo wings. YUM! Ooooh! I can’t wait to hear how your maple teriyaki version turns out! Thats sounds so awesome! Enjoy! And, keepinitkind would you mind if I featured your cauliflower recipe on my blog, Vegan in the Middle of Nowhere and some of the sauces I use to coat them? Thanks so much! It turned out great. I ended up making a quick teriyaki maple bbq sauce, so if I can print your recipe on the blog, link it back to your site and then add in what I made for my sauce, that would be great. I made this last week and it was soooooo delicious. I was so sad when it was all gone. need to get more cauliflower and hot sauce! Thank you so much for sharing your recipes. These look absolutely amazing and I fully intend to try them. Oddly enough I didn’t really like buffalo wings when I did eat meat. Garlic Parmesan wings were my favorite. I’m wondering how I might be able to recreate those with out using a bucket of olive oil in place of butter. any ideas? Thank you so much for this tasty recipe!! A friend brought this to a vegan potluck and I tasted it and it was divine. I honestly may not have tried it had someone not made it for me. But man, and I glad someone did. It is SOOOOO good. I’ve made this dish myself many times now. Thank you so much for this tried and true recipe!!! Hello! The recipe looks fabulous, can I sub miso for something else? It’s a bit expensive, and I don’t use it often enough to justify getting it. As one other person alluded, batter made from 1c milk and 1c flour is far too liquidy and leaves you with cauliflower sitting in a puddle of batter baked on to your pan. Save yourself the aggravation and just roast the cauliflower and toss it with Buffalo Sauce (Frank’s), not sure what BBQ and sriracha have to do with Buffalo Wings anyway. I’ve made this recipe dozens of times and have never had a problem. I find that when I grease or spray my casserole dish with olive oil before adding the coated cauliflower, I don’t have any problem cleaning it afterward. As far as the sauce is concerned, most hot sauces cause me a ton of pain later on. Sriracha is the only one that doesn’t and I chose to make my own “Buffalo” sauce using Sriracha as the source of heat. I encourage my readers to make substitutions as they see fit and a few readers have mentioned they made it with Frank’s sauce and it turned out well. If you made this recipe and had a bad experience, I apologize. If you’ve not tried this recipe and are simply giving your two cents, I would appreciate it if you tried the recipe before offering up criticism. Thank you. That must have been an April Fool’s joke, right? (Or just an April fool!) The proportion of flour to liquid is perfect. I, too, have made a similar recipe several times and the cauliflower turns out wonderfully. Maybe Andrea washed her cauliflower and it was still wet? I made this again the other day – because it’s amazing and I really think it’s WAY better having the batter than just roast cauliflower with pre-prepared buffalo sauce. This time, to avoid the batter sticking to the baking tray, I lined my tray with baking paper and it turned out perfect. No sticking and easy to clean tray. I might be baking paper’s biggest fan. The recipe is awesome. Thank you, Emily! And I agree- I wish I could buy stock in parchment paper! I go through it so quickly (and I reuse it as much as possible!). And I think it is much better with the batter than without- with the garlic powder and paprika, it adds a little extra oomph, not to mention the protein you get from the chickpea flour (if you use the chickpea flour). Yes! This was absolutely amazing! I just can’t even believe how good this is… I think I had the same reaction just reading this post as Chris and so of course I HAD to make it, but my boys didn’t seemed to be as enthused viewing the photos when they asked what was for dinner… ‘eew, that looks disgusting -like meat’ said my 5er and when I reassured him it was cauliflower that got even more eews from both of them… but they were definitely singing a different tune when it came out of the oven, heh… big hit with all six of us and we will definitely be making this again. Thank you so much for coming up with and sharing this incredible meal… it’s ridiculously, crazy good! I wanted to walk out of the house and accost strangers and passersby to rant and rave about how unbelievably divine this pizza was as I was eating it… stuff this good you just can’t keep it to yourself, I guess! Also, this was very filling -usually when we have pizza for the size this made we probably would’ve need 3 or 4 to fill us up along with a side, however just the one pizza filled us all up and we even had leftovers. Delicious and satisfying, doesn’t get much better than that. I love your recipes! I just made this with buffalo wing sauce because I was curious about the taste. I don’t remember having buffalo sauce if I ever did. It was awesome on top of your bleu cheese spread. I just added a little over a 1/2 cup of vegan buffalo wing sauce to the batter and baked the cauliflower (eliminating the bbq / hot sauce in your recipe and that step). I also added ~1 T earth balance butter to the batter because I think buffalo sauce is usually prepared with butter. In retrospect,it might not be necessary. I kept everything else the same including the crust – I LOVE these crusts. They’re such a life saver when I’m rushing around. The cauliflower came out pretty spicy to my taste. I just thought I’d share this variation in case anyone reading this recipe misses buffalo sauce or is curious about it’s taste like me. Next time, I’ll make the barbecue sauce version, and it will be delicious too!! Thanks for the recipe – so filling and tasty! I made these to take to a party this afternoon (just the buffalo cauliflower, not the pizza) and they were gone in less than five minutes. A big hit! Thanks. FYI, I didn’t have any chickpea flour on hand so I used all purpose, and I never cook with nuts for a party (because of allergies) so I subbed coconut milk plain coffee creamer which I had on hand. Fabulous! Thank goodness I set a bit aside for dinner. I need to make this but can’t find kelp anywhere! Anything I can substitute? Black salt? This is amazing!!! :) eating it right now! :) can’t get that crust in my neck ‘o the woods (Nashville) so I used your recipe for the cheesy pizza? I’ve never made my own crust before, and this turned out perfectly!!!! Thank you so much! 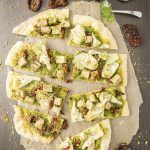 Is there any way to make the blue cheese dressing without tofu? I prefer to be soy free. Thanks! Are the cauliflower supposed to get crispy? My batter was cooked (kinda like bread) but not brown and crispy. Or, I don’t even know if they’re supposed to be, but yours look crispy in the photos. Thanks! By the way, my pizza was still in the oven when I asked about the crispiness of the cauliflower. Took it out of the oven about 10 minutes later, tasted it, and it was AMAZING! My husband and I both LOVED it! I’ll definitely be making this again. So when is your cook book due out? I made this pizza and it was absolutely delicious! Even my omni sister raved about it. I had leftovers of both the tofu and cauliflower so I made a salad: those, plus lettuce, homemade coconut bacon and pineapple. SO good. Thanks for sharing this. It’s seriously awesome and I’ll definitely be making it again. This looks great. Is it possible to substitute soy milk for almond milk and cornstarch for arrowroot? It’s just that these are the things I have on hand so its cheaper for me than going out and buying those ingredients just for this recipe that and I am running out of room for spices in my tiny kitchen! Both of those substitutions would be fine. made the buffalo cauliflower tonight and stuffed it into a pita with carrots, celery, lettuce. I was delicious! Even my meat eater husband loved it. Thanks so much. Hi there! Tried out this recipe (ish) tonight, and mostly LOVED it! My boyfriend didn’t even realize the “cheese” was tofu, though I have to admit, that was probably my least favorite part. It’s totally on me, though — we couldn’t find kelp OR miso, go figure, and rather than running around to a million different stores, I just decided to wing it. The tofu spread didn’t really taste very bleu cheesy at all, and I was just wondering — how close to bleu cheese is the flavor when you do add the miso and kelp? Is it like, “man, this tastes like bleu cheese! !” or does it just give it a bit of that umami flavor reminiscent of it? (Just wondering if I should hunt down those ingredients and try it again, or just stick with the cauliflower wing part of the recipe in the future.) Really though, great recipe! Jess @ Floptimism recently posted…tart cranberry relish. Could you use just regular pizza crust or does the cornmeal pizza crust really make the pizza? Sorry for the late response, but while I prefer the crispness of the cornmeal crust, as well as its flavor, I think any pizza crust would be fine. This is beautiful and I’ve been excited all week about making it!!! I used capers in the blue cheese sauce because didn’t have kelp and I also added arugula under the layer of cauliflower. It is all assembled and waiting to get warmed up after the Super Bowl starts. I made a Bobs Red Mill GF multigrain pizza dough. I made this pizza tonight and it’s awesome! Thanks for the recipe and the ideas! Hi! Could I use red miso instead of white for the tofu recipe? Thanks in advance! I don’t think that would be a problem. It will probably just be a little stronger. Good luck! I made this for my husband and his friends for card night and they devoured it in about five minutes. Thanks for the recipe, it was a hit! this looks amazing I read that cauliflower and bbq sauce taste just like chicken nuggets so I very excited to try!